We switched from Gmail to ProtonMail in 2017 and wrote a post about the benefits and downsides back then. There is one obvious feature that people keep talking about, or to be more precise, a missing feature: calendar. Before making the switch we expected a calendar feature to be added: “sometime in the future”. While we are happy with the service overall, running a digital business without calendaring is impossible! So we were looking into how to combine ProtonMail with Google (G Suite) Calendar. One thing many do not seem to know is that you can combine these two services – without using Gmail. 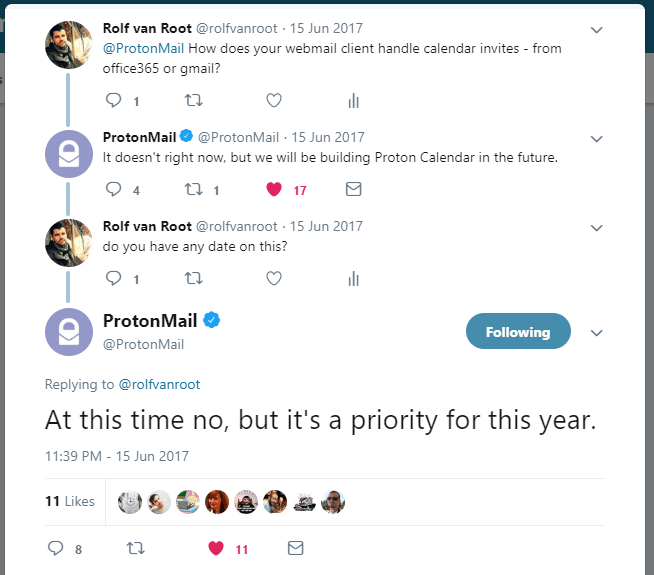 A calendar is now a priority for ProtonMail for quite some time! How does the set up work? If you are already using GSuite and want to stop using Gmail you need to sign up for ProtonMail and point your domain MX records to ProtonMail. In GSuite admin center, you can deactivate Gmail (you need to de-activate the Gmail service for your GSuite account, not only disable it for individual users). While this is done within minutes, it needs some planning ahead. How do you migrate your emails and contacts to ProtonMail, and other questions, need to be thought about. Check the ProtonMail help site on how to approach this task. In our case it was this way: We have been using Protonmail with our domain freshvanroot.com for a while, and then created a new GSuite account on that domain. You follow the setup routine of G Suite, and of course, Google wants you to use Gmail – the automated process tries to change the MX records of your domain and this makes you a Gmail user. That can be avoided, just don’t click next all the time without reading :). As soon as you have completed your set up your users can go to calendar.google.com and log in with their Google ID, which is the same as their ProtonMail email address. How do ProtonMail and Google GSuite Calendar play together? not only add events to the calendar but also accept or decline invites, suggest a different date or time. Opening a calendar invite file via ProtonMail app opens Google Calendar. This example shows an invite being updated. open invites sent from other Google Calendar Users directly in my Google calendar by clicking the links. ProtonMail web app does show the content of the invites received, but this does not work so smooth for invites sent from Office 365 users (they lack the add to calendar link for Google of course). I can download any calendar invite file (ICS) file, and manually import it in Google calendar. This is a bad user experience so I generally open all invites on my mobile in ProtonMail app (especially the ones not sent from other Google Calendar users). 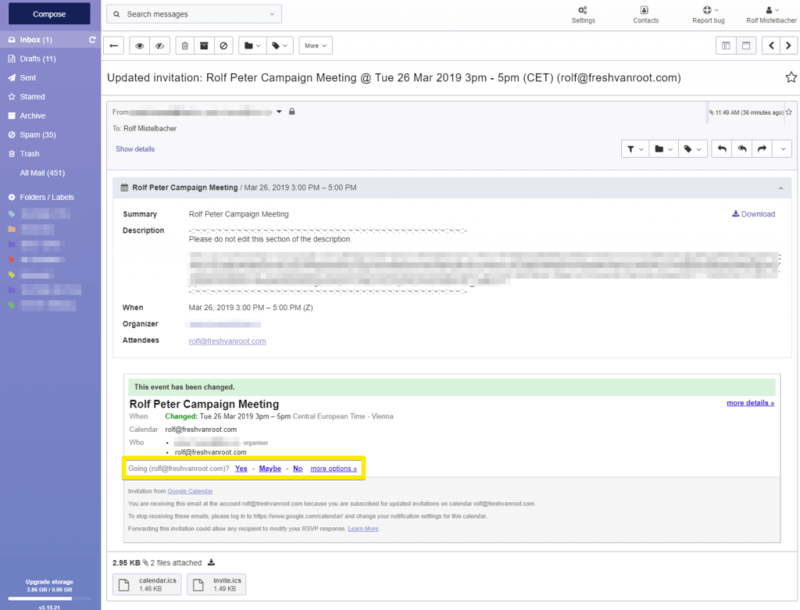 Screenshot of a Google Calendar Invite received in ProtonMail web app – Clicking Yes does open Google Calendar in a seprate tab and the event is added to my calendar. Of course, you can use all other G Suite services, especially the online conference call feature is useful. When sending invites via Google calendar, you can simply turn it into an online meeting. Is this perfect? No, it does not replace a ProtonMail calendar which would be perfectly integrated into their own web app. It is a workaround that makes things acceptable. You may say it’s absurd to use ProtonMail and then share your calendar data with Google. You are right, if your business is that sensitive, the set up outlined here is not an option. Extra costs for GSuite: Another service you have to pay for. Expensive, if you just sign up for the calendar and have no use for all the other GSuite services. You could also evaluate how you can combine ProtonMail Bridge, which brings all your emails in Outlook. By default, you can add calendar invites to a local calendar, which is not synced to any other device. If it is possible to also connect your GSuite Calendar account (or any other calendar service) with Outlook and can get your ProtonMail Bridge account to work together with it, that could be a solution. We never evaluated how that might work because it involves too many apps that need to be installed. We try to stay lean and avoid installing unnecessary fat client apps. If you want to evaluate that scenario you should take a look at the G Suite Sync for Microsoft outlook tools. Our ultimate goal is to be a “Google free business”, at least when it comes to storing our own data, but that will take some time. For the time being, we will rely on Google Calendar in combination with ProtonMail. If the calendar feature does not arrive in 2019 we will take a look at other solutions.